* A must have if you are sculpting with Plastilina, moist clay or other material that cannot support its own bulk. * Think of this as the skeleton or framework upon which you lay your clay for modeling. 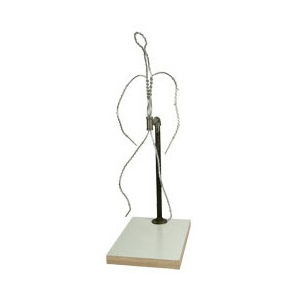 * Designed by Sculpture House, this armature is made from non-staining, pliable aluminum wire and has a fixed steel backiron on a base of formica over heavy gauge plywood. * It is made to be proportionally correct. * If using moist (ceramic/pottery) clay, please note, the armature cannot be put in a kiln during firing. * The clay will shrink but the wire will not, resulting in cracking and/or breakage. * We suggest using a wet and twisted newspaper armature as the paper will burn off during firing; or a wax armature as the wax will melt during firing. Please note, the FA36 is a Special Order Item and may require an additional 7-10 days of production time.